Contact lenses are one of the safest and most convenient methods of vision correction. Contact lenses sit directly on the eye. Because of this, it is easy for them to introduce contaminants that may lead to serious eye problems. Taking shortcuts in the proper care of your lenses or your eyes can result in eye irritation, infection, or in some cases, even blindness. 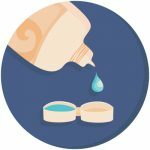 So let’s review how to properly clean contact lenses to ensure they don’t cause any issues down the road. Washing your hands before handling your contact lenses is essential in preventing debris from damaging the lens material. Additionally, having clean hands before handling contact lenses will reduce the risk of hand-eye transmitted infections. It is best to avoid using antimicrobial soaps to help prevent the risk of eye irritation. Remember to dry your hands with a lint-free towel afterward. Once your hands are washed and dry, take one contact out and place it in your palm. Use contact solution to soak the lens in your palm and gently use your index finger to rub the lens in the solution. After the lens has been rubbed thoroughly, with it still in your palm, rinse it with more solution to remove any additional debris or particles. If you aren’t wearing your contacts after cleaning them, then it is important to ensure they are stored properly. Make sure that your contact lens case is clean before filling both sides of the case with solution and placing each contact in the proper side. Be sure there is enough solution in the case to completely submerge both lenses. Remember to never reuse solution to soak your contact lenses — always fill it with new solution each day. Before wearing them again, be sure to repeat the step above. By following these simple steps, you can ensure that your contact lenses will stay clean, reduce the amount of eye irritation, and be more effective at improving your eyesight. Remember, if you wear contacts, it is important to schedule a regular eye exam and contact lens evaluation with Bella Eye Care Optometry to ensure that they are effective in improving your vision. If you are interested in wearing contact lenses or need a contact lens exam, you can rely on the Newark eye doctors at Bella Eye Care Optometry. 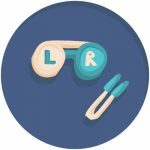 Our doctors can fit all types of contact lenses, including astigmatism lenses, multifocal lenses, and RGP lenses. Additionally, we carry a wide selection of designer eyeglass frames for you to wear when you choose not to wear your contacts!